Polycystic Ovarian Syndrome (PCOS) is one of the most common hormonal disorders, occurring in as many as 10% of women aged 12-45. It is also considered one of the leading causes of female infertility. If you are a woman suffering from PCOS and are having difficulty conceiving, you should look into acupuncture treatment as a safe and healthy way to improve your chances of pregnancy, as well as treating your endocrine disorder. All women who suffer from PCOS do not experience all of these symptoms, but may only be showing a few, some more prominent than others. Age, ethnicity, genetics, and overall health can have a lot to do with how the disorder manifests itself. To treat PCOS, women are usually prescribed medication such as metformin or glucophage, in order to balance out insulin-sensitivity; or contraceptive pills that contain “female” hormones like estrogen and progestogen. However, the medicines affect your hormone levels, and chemically alter it, leaving you with a whole list of side-effects. Sometimes, the medicine takes about 6 months to show result, and during that time, your self esteem and mental health suffers. Your infertility levels also remain as they were and your time to start a family gets further delayed. This is why more and more women are opting for alternative medicine, and trying our acupuncture therapy for treating their disorder. When compared to endocrine intervention, acupuncture is a much safer and more effective method of treating Polycystic Ovarian Syndrome and improving fertility. Acupuncture helps in a lot of female reproductive disorders, but is especially beneficial to women suffering from PCOS since it helps increase blood flow to the ovaries. This, in turn, helps reduce the size and number of ovarian cysts, increases insulin sensitivity, and decreases the amount of insulin and glucose in the bloodstream. The decrease in insulin leads to a decrease in testosterone, alleviating problems of weight gain and hair growth. 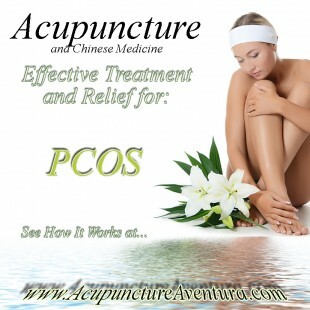 Studies have shown that acupuncture treatment for PCOS leads to regular period cycles, reduced levels of androgens, and significant weight loss. For improving fertility, it may be used in combination with other methods such as IVF, but can be done in isolation as well. At our center in Aventura Florida we have treated PCOS successfully, and truly believe we can help you as well. Acupuncture therapy has no adverse affects for you or your baby, and can help you start a family in a healthy and safe manner. To make an appointment, call us at (786) 537-7022 and we can begin your treatment.